My Mom and I think . . . it’s quite over-rated. The two of us are quite alike. We aren’t the flower type, or the jewelry type, unless it a big fat diamond. I think I’d rather have a new pair of jeans or shoes or money honey! 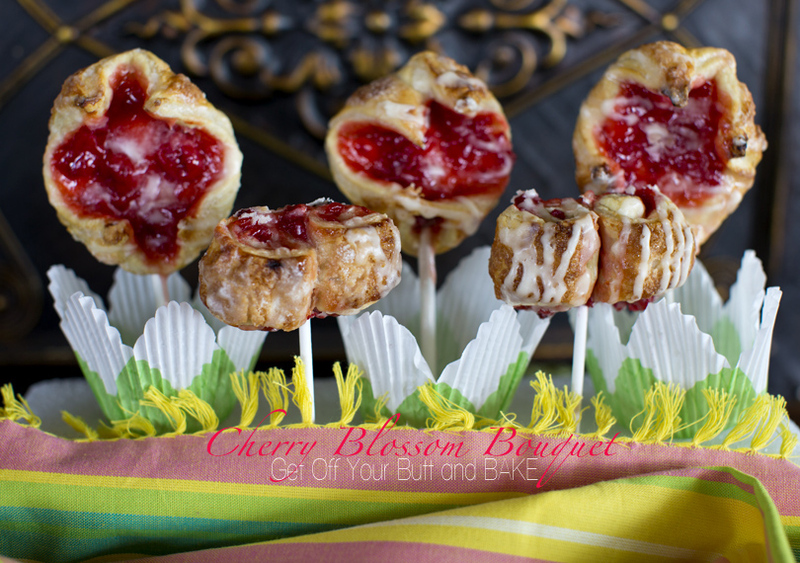 Give her a sweet edible delicious Cherry Blossom Bouquet! You could also just arrange them on a nice plate. Over at Babble, they have a great Mother’s Day post. It’s quite funny . . . Moms are truthful about what they really want. 6. I’m just gonna lie down for a second. OK? 8. On that note, please skip the Mother’s Day brunch. “Every time my husband asks what I’d really like for Mother’s Day, I feel so guilty that what I really want is a day to myself: at a spa or with other women who need time off,” says Kimberly Clayton Blaine, a child and family therapist in Pasadena, CA. “But when I ask for that he says, ‘You don’t want to be with your family?’ Then I feel like a bad mom, so I say, ‘Why don’t we all go to brunch at a family-friendly place?’” But what mom really wants to go to IHOP? So how about quality family-time Saturday, me-time Sunday. Deal? 12. A day without poop. Dirty diaper? Your turn. Just in case you need some Puff Pastry in your life right now, I’ll show you how simple they are to make & bake! Don’t go over board and add too much filling. In fact, I used a bit more than I really should have. It’s important to roll the pastry in from both sides. Rolling in from both sides to the middle, will lessen your chances of rolling all the filling right out! Cut 1″ pieces with a Serrated knife. Secure the two rolls together with a toothpick. Place on a cookie sheet lined with Parchment paper or a Silpat. 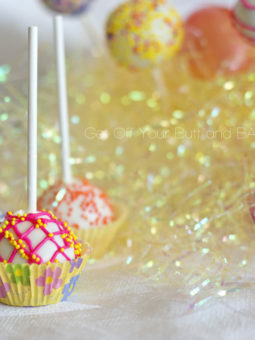 Brush the top lightly with egg wash and sprinkle with sugar. Egg wash = 1 egg + 1 tablespoon water. Beat together until mixed thoroughly. Bake in a preheated 400 degree oven until tops and bottoms are nice & golden. After they cool, you can eat them right now . . . or drizzle with a Vanilla Orange Glaze. Now for the Cherry Blossoms. Start by flouring your work surface, and using a rolling pin roll out any creases that your puff pastry might have . . . . right out of the box. Take a pizza cutter and measure 9 equal squares. Place about 2 teaspoons of filling in the center of each square. Bring up all four corners and press together. Note: If you want open Blossoms, then press together firmly but not so tight that they won’t open. If you want closed blossoms, then pinch and seal very tightly. Place them on a cookie sheet lined with Parchment paper or a silpat. 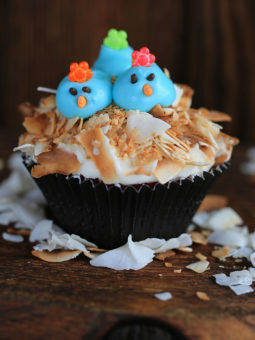 Brush the tops with your egg wash, and sprinkle with sugar. (see above) Place in a preheated 400 degree oven. Bake until the tops and the bottoms are very golden brown. We like our Puff Pastry very crispy, so I bake mine very golden. The baking time is about 15 to 20 minutes. Once they are cool . . . If you like, you can drizzle the Vanilla Orange Glaze over the tops. This is a fast simple idea for a flower bouquet. Everyone can simply pluck a Cherry blossom to eat! I used long sucker type sticks to make the flower blossoms. Just insert them through the thickest part of your puff pastry to secure. 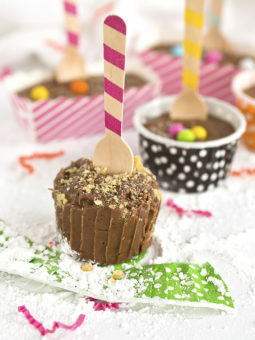 I poked the other end of the stick through pretty little cupcake liners, and then down into a piece of styrofoam. You could fill the liners with Mini Oreo’s or even tiny chocolate mints to resemble dirt. I simply . . . didn’t have any !!! They also make pretty pearly pink, orange or green six-lets that would also look pretty in the bottom of your liners. You could also just tie several Cherry Blossoms together with a pretty bow. Sugar for sprinkling over the tops. Cut 1″ pieces with a Serrated knife. Secure the two rolls together with a toothpick. Place on a cookie sheet lined with Parchment paper or a Silpat. Brush the top lightly with egg wash and sprinkle with sugar. Egg wash = 1 egg + 1 tablespoon water. Beat together until mixed thoroughly. Bake in a preheated 400 degree oven until tops and bottoms are nice & golden. After they cool, you can eat them right now . 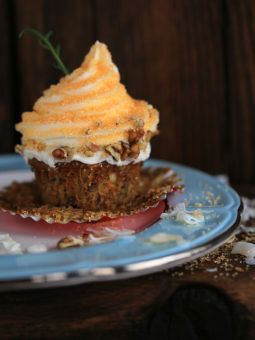 . . or drizzle with a Vanilla Orange Glaze. 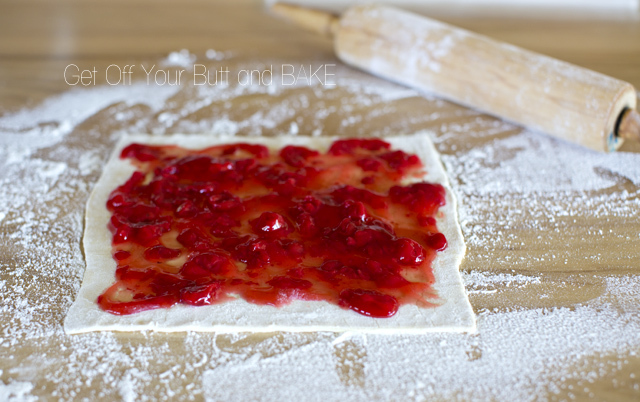 Start by flouring your work surface, and using a rolling pin roll out any creases that your puff pastry might have . . . . right out of the box. Take a pizza cutter and measure 9 equal squares. Place about 2 teaspoons of filling in the center of each square. Bring up all four corners and press together. Note: If you want open Blossoms, then press together firmly but not so tight that they won’t open. If you want closed blossoms, then pinch and seal very tightly. Once they are cool . . . If you like, you can drizzle the Vanilla Orange Glaze over the tops. In a small bowl add one cup of Powdered sugar , melted butter and vanilla. Add one tablespoon Orange juice or milk and stir together until nice and creamy. If it is too thin … add a bit more powdered sugar. If the glaze is too thick . . . add a bit more Orange juice or milk. What a great, simple idea…very tasty too!! Could it be adapted with jam? I’ve used jam before, and it tastes great! What a fun post. 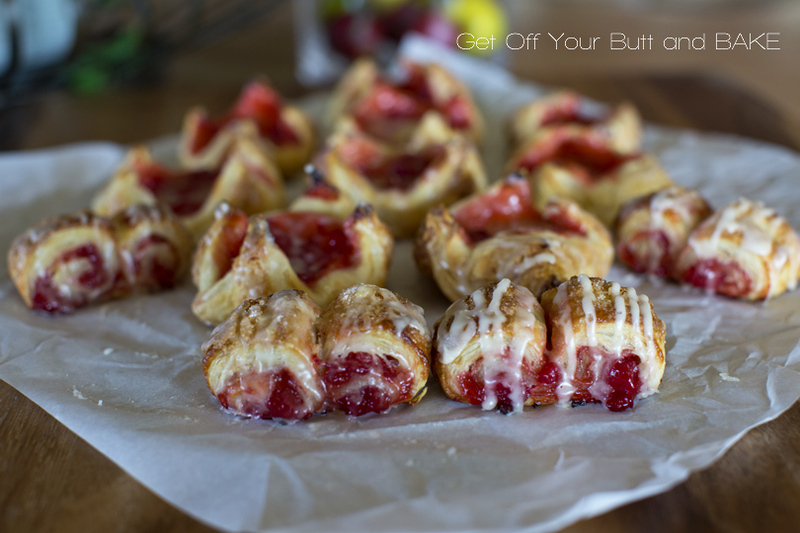 I have some puff pastry in the freezer–instant gratification.